Autumn is here, marking the start of days growing colder and crisp and producing a magnificent array of golden, reddish, and brownish hues and colorful fruit. This season offers a plethora of beautiful and fun inspiration that many fall weddings draw from for their overall bridal décor. While your flowers, wardrobe, favors, and other decorations may integrate this season, many people never think about incorporating those themes into their rings' design. For all fall brides and grooms, why not draw inspiration when choosing your wedding bands from this season? Matching the style of your nuptial rings to the season is a stunning and personal way to commemorate your special day. We offer a fantastic selection of wedding bands for men and women that incorporate the season's elements. Reasonably priced, marvel at these quality options that add a dash of the equinox to your eternal commitment. 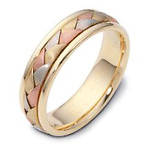 The first of the three main autumn wedding band options is the Tri-Color Gold wedding band. The combination of yellow, rose, and white gold reflects the colors of the season. These three shades marry seamlessly and elegantly, and its simplicity makes the tri-color gold ring a splendid choice for autumn brides and grooms. 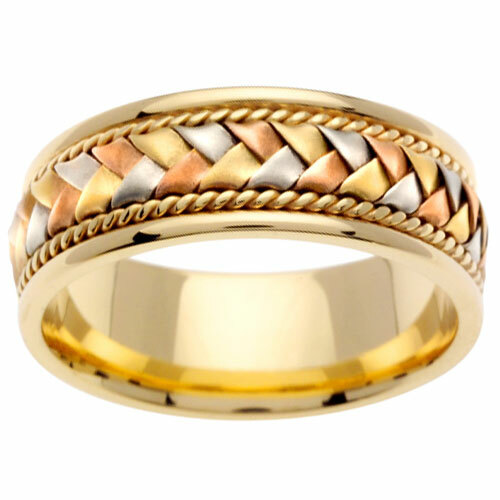 Another way to further highlight the autumn season in your wedding is to opt for a wheat braided wedding band. The wheat reminisces harvest time, representing the bounty and sustenance of your relationship. Furthermore, braids symbolize a strong bond, just like the love you and your fiance share. 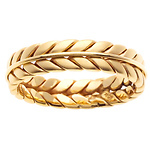 The intricacies of a wheat braided ring make it a striking choice for autumnal nuptials. While many associate fall with golden leaves and harvest, this season reminds people of Halloween [Read Tips on Creating a Halloween Wedding]. 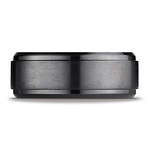 For those of you who chose an autumn wedding to hearken to the charm and mystique of the season, a black wedding band might be for you. If you would rather have a more traditional, lighter-colored wedding band, such as silver, gold, or platinum, inlaying black diamonds or stones elicits the same mystical response as a black ring. 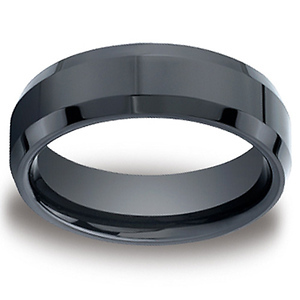 Black wedding bands and gems suggest the magic, allure, and power of the bond between you and your love. As the leaves change color, harvest begins, and magic wafts and whispers through the air, you set your date in autumn because you love this time of the year. You can love it all year long by weaving the season into your wedding band design. 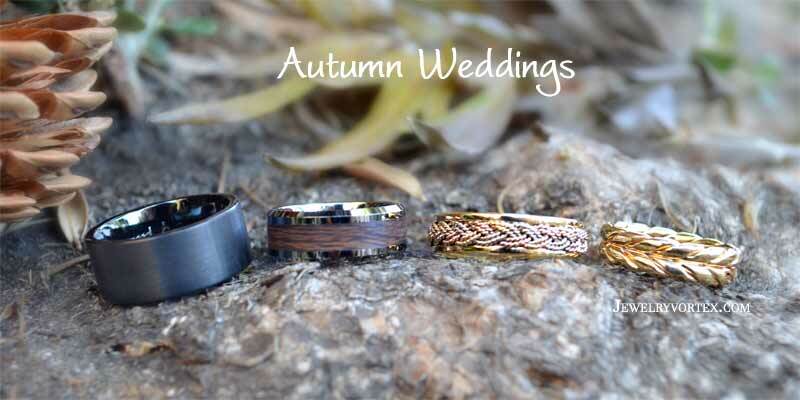 With tri-color gold, wheat braided, and/or black wedding bands, the beauty of autumn and your wedding lingers close to your heart no matter the season. September has become the second most popular month to get married. Whether it's the changing of seasons signifying the beginning of a new chapter in life or the beautiful warm colors and fallen leaves of autumn, this month is a splendid time to say your wedding vows. If you are getting married next month and still have yet to buy your rings, NOW is the time to get them. You should allow at least 2-3 weeks at the bare minimum to order your rings just in case you need to resize them and/or allow time to make the ring as certain styles are made-to-order. To help you decide on what to buy, we came up with a list of our top 5 wedding bands! 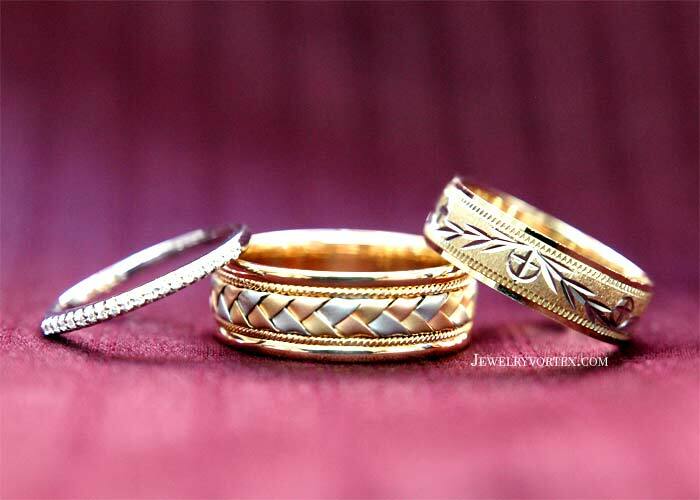 The symbol of an everlasting love woven together in a tight bond attracts many people to this wedding band. Plus, its yellow, rose, and white gold braid and handmade cords create a striking design that draws the eye, more so than a plain wedding band. 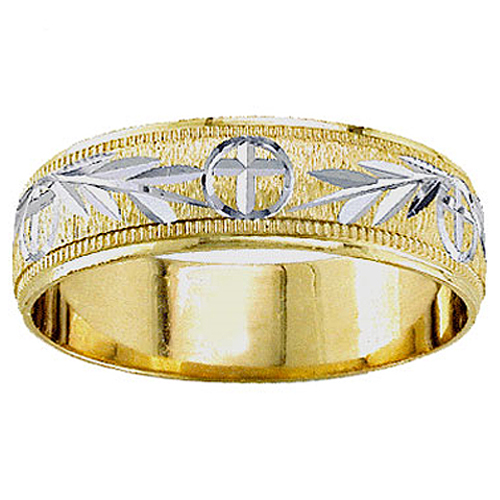 Shining with yellow gold, this wedding band has elegant white gold carvings featuring Christian symbols, such as the cross and ivy. It has a timeless beauty that attracts many of our male and female customers belonging to this faith. 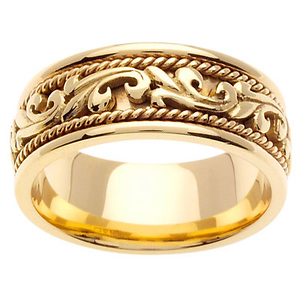 Also, this gold ring's price makes it more accessible for those who want the luxury of gold at a more affordable price. While a traditional, plain ring is common, the matte grooves in the middle of polished edges adds a stylish, modern twist to the classic band. 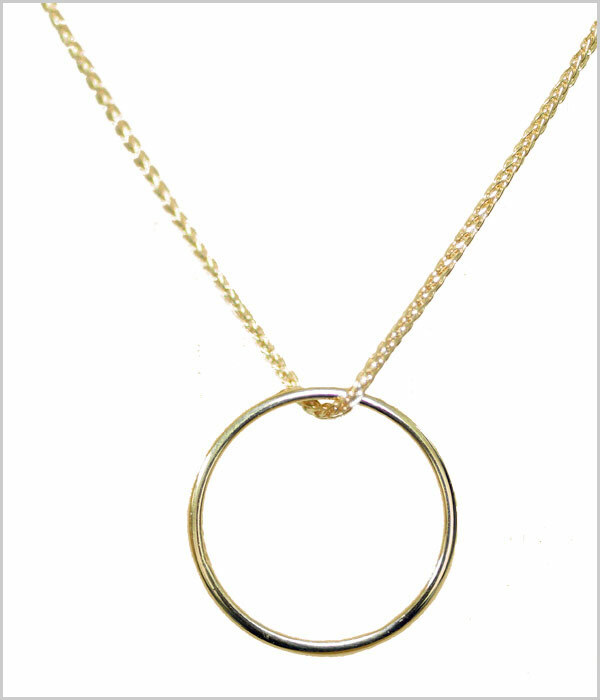 Also, it is made with a more affordable, tarnish-resistant precious metal, Argentium silver. 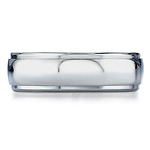 This ring is popular among men and women who want a timeless, designer style at a great value. Notice the flourishes reminiscent of art from the past carved into this ring between two hand-woven cords. This yellow gold ring's artistry is simple yet exquisite, enticing many people to choose this ring. Since wedding bands are meant to be worn forever, why not wear a piece of art that you can cherish for years to come? 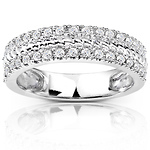 This sparkling wedding band is popular among women who want to wear a gorgeous ring that stacks neatly against their diamond engagement rings, especially a halo ring. As a delicate beauty at a price that fits most budgets, many brides select this band to complement their solitaire rings or for its sparkling simplicity. Choose one of these beauties or select from our fine collection of wedding bands. Why Are Ceramic Rings Becoming Popular? Looking for a new ring that is fashionable and reasonably priced? Consider ceramic. Ceramic jewelry is becoming more and more popular over the past couple of years. The sleek and shiny, modern, high-tech look attracts many people who want something eye-catching. More practical folk may opt for ceramic due to the durability and inexpensive price. Some just like an unconventional choice. 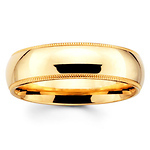 Many couples choose ceramic wedding bands over traditional choices such as a plain gold band. The wide variety of looks and styles available also contributes to the rising demand for ceramic rings as fashion accessories for men and women. If you are unfamiliar with high-tech ceramic, you may be wondering why anyone would want a ceramic ring. Aren't they fragile? No, these ceramics are nothing like the more familiar ceramics used in pottery and figurines. In fact, ceramic rings composed of high-tech ceramics such as titanium carbide, a combination of titanium and carbon, are very durable. Titanium, aptly named after the Titans of Greek mythology, is used in many applications that require a strong yet lightweight substance, such as aerospace engineering. Carbon, of course, is a major component of diamonds. You may know of titanium carbide's extensive use in cutting tools. The substance's hardness and resistance to wear makes it perfect for that, as well as many other industrial applications. It also makes it perfect for creating tough, shatter-resistant, scratch-resistant, lightweight, and easy-to-maintain jewelry. Ceramic rings are very affordable in comparison to rings made from gold, platinum, and other traditional materials. Yet, unlike most other inexpensive jewelry options, ceramic is high quality and long lasting, making it an excellent value. Ceramic rings are available in a wide variety of styles. The most common are simple black bands, but that is only the beginning. Etched designs, faceted surfaces, and inlays of metals, precious stones, wood, carbon fiber, and many other materials offer an almost endless variety of choices. Ceramic rings may be considered unconventional currently. Yet, it is easy to see why they are becoming a standard option at fine jewelry stores and likely to continue to be a favorite choice. Learn more about ceramic rings' pros and cons in JewelryVortex’ Shopping Guide. See why ceramic rings are sought after in our collection here. Make Dreams Come True with Bill Me Later! There it is -- the perfect wedding ring or diamond jewelry. Nothing says "I do" like the bold accents of spectacular sparkles, hint of gold, timeless elegance of beauty, and incredible value forged over a millennia of natural forces. And nothing says it better than diamonds! You can't put a price on the rush of emotion from a person when presented with such a beautiful gift or that gorgeous ring to symbolize your matrimonial vows. That's why we now offer PayPal's Bill Me Later option. With Bill Me Later,you can say yes to the dream, the emotion, and the love without the financial pressure of having to pay for the full amount immediately. With Bill Me Later you can say yes to the dream, the emotion, and the love in the eyes of the recipient of your token of joy, without the financial pressure of having to present immediate payment. Bill Me Later is a new service from PayPal that allows you to make your purchase now and pay your for your jewelry order later. It's really a secure, quick, and reusable credit line without the hassle of carrying around plastic. It's easy to use and comes in mighty handy when you want to make larger purchases for higher-end wedding rings or jewelry for your loved one. The special financing offers you receive give you the extra flexibility to buy more of the things you dream of having as well as choose how you want to pay— either all at once at a later date or over time with monthly payments. To top it off, you get peace of mind with the Zero Fraud Liability and PayPal's Purchase Protection programs. What can make your buying experience even more pleasant? Once you decide on your fashion style for a special occasion, we can help you accessorize your outfit the way you envisioned it. Do you want funky wedding jewelry? Or are you hoping for a more classical look? A simple piece of jewelry may be all you need to pull it off. If it's a wedding we're talking about, check out our line of engraved wedding bands— easily one of the very most important jewelry pieces you'll ever own. Do it right and make it deeply personal. Bill Me Later can help you make it all happen. It's quick, easy, and it gives you the extra breathing room you need to handle the transaction. Bill Me Later is a safer, faster way to make those large purchases of diamond rings, bracelets, earrings, and necklaces. If exquisite, high-end diamond jewelry is what you want, then Bill Me Later is how you want to pay for it. You can have everything you want with Bill Me Later as your financial tool to help you afford the very best in life. You deserve it, your loved one deserves it, and you both deserve to enjoy it all. Click Here to get more details on Bill Me Later. Or find your dream jewelry now! Please Note: These prices are current as of this blog post's publish date. Prices are subject to change. We’ve all read plenty of articles about choosing wedding bands for women. 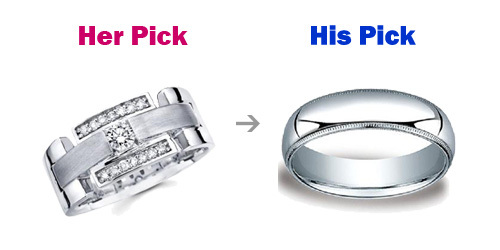 For some reason, everyone assumes that men need a lot of help in this department…let’s be honest, women need just as much help when it comes to choosing a wedding ring for their man. Women, you know what you want in a ring, and you probably also have an idea of what you want your husband to have. But the most important thing you need to know is what he wants to have as his wedding band. Just as you’ll wear your band for decades, he’ll wear his. It should be something he really wants. Admittedly, we men are generally not as design-minded as you. We like something simpler. You know your husband or husband-to-be the best, however. Just as he undoubtedly considered your personal style when searching for your perfect ring, do not neglect to consider his fashion sense. 1. Consider what material is best for his needs. Gold is traditional and highly valued for wedding rings, but because of the softness of this metal, it can be easily scratched and bent, making it less ideal for a man who works construction, masonry, or landscaping. The best metal to choose for a man who works with his hands is titanium because it is more resistant to scratches and very strong. For a couple trying to save money, another option is silver, particularly Argentium silver rings. Compared to gold, platinum, and titanium (other common metals for men’s wedding rings), this type of silver is classically beautiful, similar to white gold, and more affordable, especially if you want a bigger ring or want diamonds. 2. Choose a style. As with metals, there are many to choose from, so considering his needs and style are of upmost importance. Does he feel comfortable wearing a necklace or even a bracelet? If he feels uncomfortable wearing any type of jewelry, a ring with an intricate design might not be best. 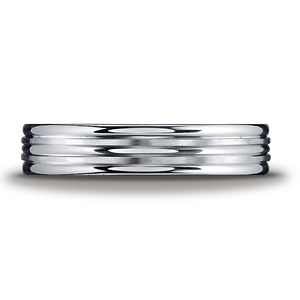 Instead, consider a plain, classic wedding band with no design elements nor sparkling diamonds or gemstones. Consider milgrain or step-down detailing if you want a little bit more flair that is not too flashy. In the reverse situation, an outgoing guy or someone who feels more comfortable wearing jewelry with a bigger fashion sense might want something flashier as something subtle would fade into the background. 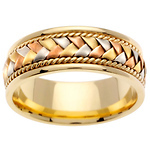 Braided rings or scroll design rings are popular styles for men as well as the simpler types. 3. With stones or no stones? Be very careful when choosing a ring set with stones. You may love large diamonds for your fingers, something to really draw the eye and sparkle, but we usually prefer something less extravagant. Black diamonds in channel settings are really the best way to go. These stones provide some visual interest, while still remaining decidedly masculine. 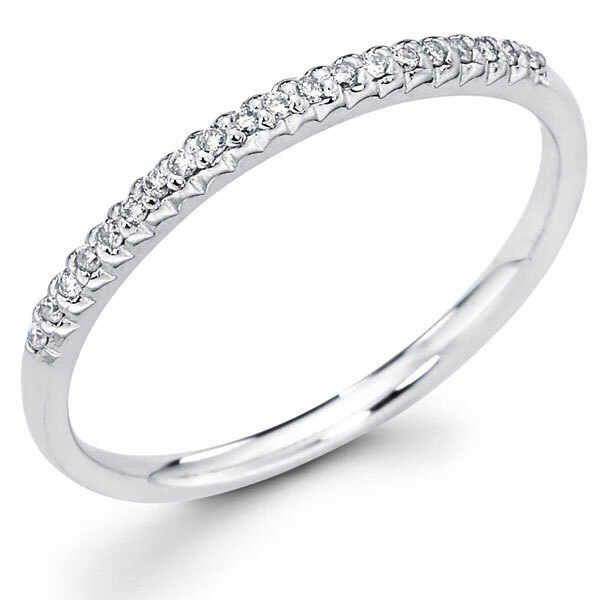 If you still want to get a diamond band, then rings with small diamonds are best - but the fewer stones the better. 4. Ask your man what he likes. There’s no harm in asking what type of ring design or metal we’d like. Yet, sometimes, I know some of us men have no clue as to what we like and feel uncomfortable in the jewelry department. While keeping in mind the tips from above, gather a few pictures of bands you think we would like, show us, and let us pick. If your man still feels uneasy or clueless as to what he wants, then you just have to take your best guess on what ring to buy. A man’s wedding band doesn’t have to break the bank. Silver or tungsten can make handsome rings that will take the abuse of a working man’s day to day without emptying your accounts. Really, the most important aspect of the ring is that he feels comfortable in it, isn’t it? Wedding rings are a way for you to show each other your love. It doesn’t have to be a guessing game. He’s your fiancé; chances are, you know him pretty well by now. Just draw on your knowledge of what he wears and what he does for a living. For men, a ring that fits into those two aspects will be exactly what we want. 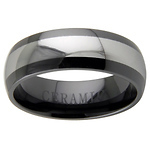 Visit JewelryVortex' large, fine quality collection of men's wedding bands here. Related Blog Posts & Guides: Pros & Cons of Titanium Rings, More Tips on Choosing a Men's Wedding Band. Planning for a spring wedding can be a very exciting and emotional experience. Not only are you lucky enough be able to exchange vows with someone you love very deeply, but you also have the added benefit of planning a beautiful and memorable spring-themed wedding. If you want your wedding celebration to be the talk of the town then you need to make sure that you pay close attention to important spring wedding trends for dresses, cakes, jewelry, and favors. To make sure your wedding is everything you dreamed it would be, consider following this advice for planning for a spring wedding in 2013. If you want to turn heads on your wedding day and impress the groom and your guests, look for a wedding dress that incorporates some of the above characteristics. The goal is to choose a cake that is trendy, eye-catching, and absolutely unforgettable. Ask your photographer to find creative ways to photograph your jewelry and gorgeous wedding bands with the beauty of your theme and spring around. Adding a touch of color to your jewelry will add warmth and depth to your wedding attire. If you follow the advice above, you will be on your way to planning a memorable and romantic spring wedding that will be sure to impress your guests this year. In our last blog, I offered tips on finding diamond engagement rings that fit your budget. Now, it's time figure out what to put as an engraving in an engagement ring or wedding band. We have seen a growing trend these days of engraving personalized messages onto rings. Not too long ago, engraved rings were common, but they usually only contained names, initials, or a special date. Nowadays we see our customers getting very creative with their engravings and wanting specific messages that mean something to them and the recipient. Our customers are even adding engravings to gifts to their family members and friends. 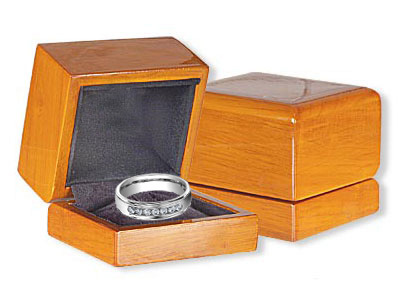 Read on to get useful ideas on selecting a special word or phrase to engrave on wedding bands, engagement rings for men and women, and gifts and learn about popular engraving messages. Ring One: To Infinity… -- Ring Two: And Beyond! Add some extra personality to your ring with a personalized engraved message and let your recipient know how much you care. If you can think it, it can be engraved! You have found that special someone with whom you want to spend the rest of your life with and decided to pop the question. It is now time to purchase an engagement ring that she will love. Even if you don’t have a lot of money to spend, you can still find a ring that will take her breath away. 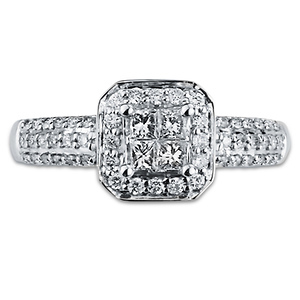 Read on to find out how you can find more affordable diamond engagement rings. In order to get an idea of what is a reasonable asking price, you need to shop around. A good place to begin is online. Because online retailers do not have the amount of overhead that a brick and mortar store does, they can usually offer their fine jewelry at more competitive prices. You also will have more selections when you shop online. Because you will not be able to see the ring in person before you purchase it, it is important that you read the descriptions carefully. Pay attention to the specifications of each ring to ensure that you are getting one that is top quality. Also, make sure that the online jeweler has a return policy just in case your ring has any defects or you simply do not like it after seeing it in person. Even if you are unable to afford the biggest diamond out there, there are a few tricks that can make the stone look bigger. 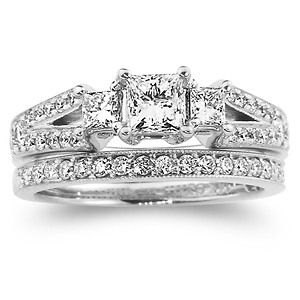 Selecting a ring with specific shapes, settings, and side stones can achieve this look. Shape. 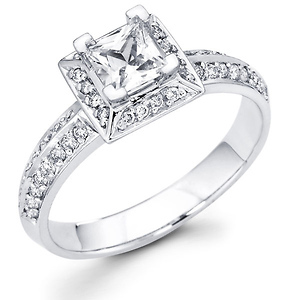 Instead of selecting a diamond that is round or princess cut, opt for a diamond with elongated sides. 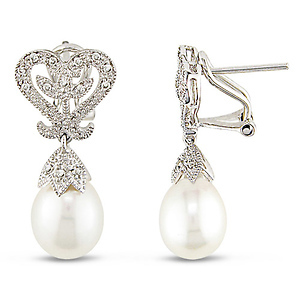 These include diamonds that are oval shaped or marquise cut. These shapes can make the diamond seem larger than it really is. Invisible Setting. Gemstones are placed close together while the ring’s band is concealed beneath the stones. When several small diamonds are placed next to each other in this setting, it can give the impression of one large diamond. Bezel Setting. 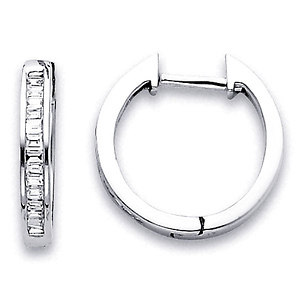 A metal rim extends slightly above the diamonds that are placed inside. When white gold or platinum metals are used in a bezel setting, they can blend with the diamonds and give the illusion of them being bigger. Side Stones. Instead of the ring containing a single large diamond, select one with smaller side stones. 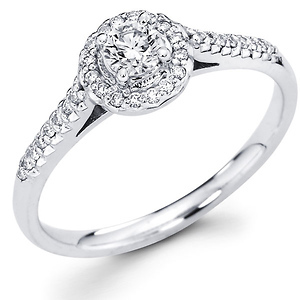 A classic look is a ring with three stones placed together. Not only can the three stones be a symbol of your past, present and future as a couple, when they are placed in close proximity to each other they can appear bigger. Halo Setting. Similar to the invisible setting, a diamond encircled with smaller diamonds make the center diamond seem larger and even more vintage-like and romantic. The halo of diamonds give the appearance that they are part of the center diamond. Purchasing an engagement ring for the one you love does not have to break the bank. Use these tips to help you choose a diamond engagement ring that gives you the best value within your budget as you begin your search. In our last blog post, we discussed whether or not proposing during the December holidays is a great idea or not. If you decided to propose during this special time, I wrote this post just for you. The holidays are just around the corner, and you’ve finally found the person you want to spend the rest of your life with. You bought a gorgeous diamond engagement ring and are now ready to pop the question, but you want the timing to be perfect. Proposing during the holidays may seem cliché, but I believe that if you plan it right, you can have a magical and romantic proposal that will be remembered for a lifetime. Here are some fun and romantic proposal ideas I have personally seen or heard of. Hopefully these ideas will help spark some creativity for your own memorable moment. If you and your chosen fiancé celebrate Chanukah, you can build up the anticipation through 8 days of unique and special gifts. Try to think of creative ways to present the gifts, such as in the mail, on her pillow, etc. On the final day, prepare a romantic moment to present the ring. Christmas Eve or Christmas morning can be a great time to propose, even if it’s somewhat expected. If you time it right, you can still create a fairy-tale moment of surprise. Of course, you could always have Santa stop in with a surprise gift box delivery. However, if you opt for this type of a proposal, make sure that everyone is gathered together for Santa’s dramatic entrance without making the scene appear too predictable. If you’re bustling around gathering your friends and family together right before he comes in, your surprise effect will be entirely lost. If you want to get a bit more creative, consider inviting carolers over to the house while everyone is gathered to listen. In the middle of an upbeat Christmas song, have the carolers pause to ask the question in unison. The bride-to-be will be dazed and delighted. You don’t have to propose on an actual holiday to gain the special effect of the holidays. In fact, you might find more of a surprise reaction if you choose a different day. One of my personal favorite proposals was through holiday lights on the outside of the future bride’s home. Family and friends were gathered for a festive dinner party, and as everyone was walking out to leave, the hopeful boyfriend slipped aside to turn on his lighted proposal. The result was total shock and utter glee. In short, it was a very romantic evening. New Year’s Eve can be a great time to propose. Many new couples become engaged on the stroke of midnight, with a large group of friends and family. However, if you want to be a little bit more intimate, make it a moment for just the two of you. Invite your sweetheart over for a special dinner, and dance to soft music in a room full of rose petals. When the moment feels right, get down on your knee. I’ve given you some ideas, but this is a moment that is entirely up to you. Get up your courage, make it romantic, and go propose to her!